Jeff and Kendra Lindsay enjoy a quiet moment on Lake Lucerne in beautiful central Switzerland. 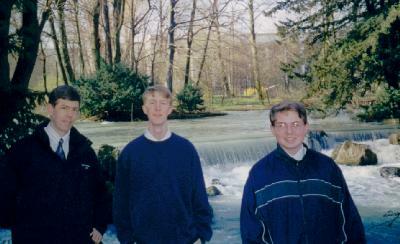 In April of 2000, I had a trip to Münich to support a patent opposition before the European Patent Office. We won! 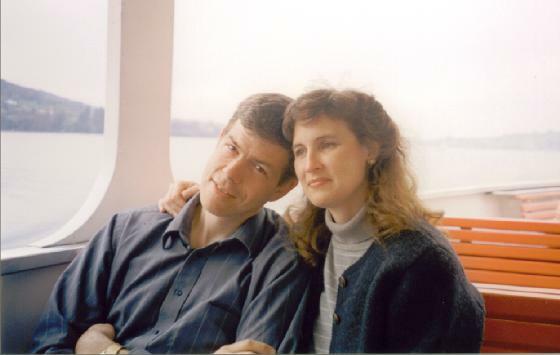 For this trip, I was able to bring along Kendra and our two oldest boys, Stephen and Daniel, and take a few days of vacation in Germany and Switzerland, where I served a two-year mission for the Church of Jesus Christ of Latter-day Saints from 1979 to 1981. It was great to be back! 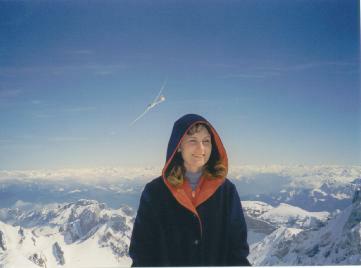 In Switzerland, my good friend Klaus Tobler took us to the top of Säntis, one of the beautiful Alps. It lies in eastern Switzerland not far from Sankt Gallen, a favorite area of mine during my mission. While we were on the mountain, a Swiss glider was working the air currents to soar higher and higher, until he got to the top of the peak. This shot shows the glider behind my beautiful wife. Here my boys and I are in the famous English Gardens of Münich by the Isar River. We really enjoyed walking through the extensive English Gardens (it was cold, fortunately, so we didn't risk running into overly natural sun bathers). We loved Münich in general. One highlight for our family was catching a soccer game in the Olympic Stadium, courtesy of a local legal firm. Such dedicated fans! 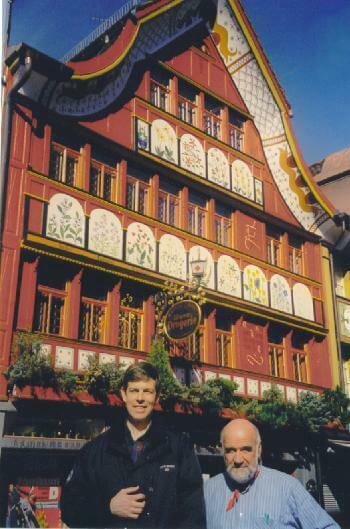 My good friend Klaus Tobler is shown with me in this photo taken in Appenzell, one of the most picturesque and delightful towns of Switzerland, again not far from Sankt Gallen. Klaus works hard to help many refugees and people in need. He's one of the best and kindest men I know. 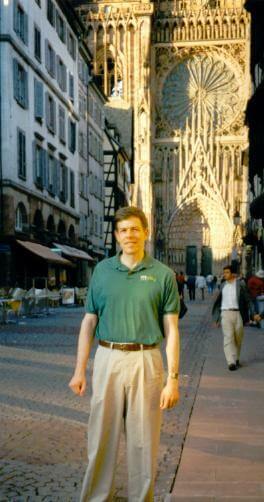 Later in June, I had a business trip to Baden-Baden, Germany, near the French border. One night I jumped across the border to Strassbourg, France, for cheap Turkish fast food and a few photos. A kind French citizen took this photo of me in front of the famous cathedral in the old city. 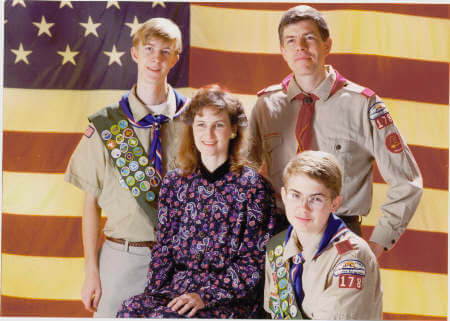 We are very proud of our son, Daniel, who became an Eagle Scout in November of 2000. Daniel is pictured here with Stephen, our oldest son and also an Eagle Scout, and with Kendra and me. We are grateful for all the support we had from good people at church and in BSA who made this possible. Special thanks to Kendra, to Scoutmaster Will Croff, and to the best friend of Scouting ever, Kathy Croff. Another highlight of 2000 was taking my two oldest boys on a BSA high adventure trek for a week, featuring rock climbing at a secret spot with a rare Wisconsin cliff and sailing on Lake Ogebic in the Upper Peninsula of Michigan. 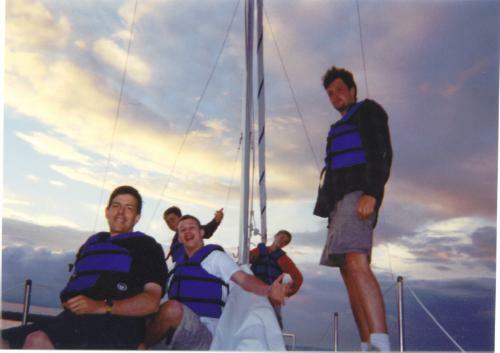 Here I am hoping to survive a jaunt on the sailboat with some of our energetic young men and a BSA staff member.